Everyone has those who they look up to. And when I say look up to, I really mean have a profound impact on your life; the truest sense of the term “role model”. The first people to crack this list were my parents (and still remain). The next, was Michael Jordan (also still remains – to this day I obsess over the Bulls and play basketball 3-4 times a week despite numerous b-ball related injuries – tongue out, of course). The most contemporary example of someone who I truly admire is a man by the name of Tim Ferriss. Perhaps you’re familiar? Amongst a staggering list of highly varied and impressive accomplishments (including being fluent in five languages, holding the Guinness World Record in tango, and winning the National Chinese Kickboxing Championship), Ferriss is the author of a pair of #1 New York Times Best Selling Books, The 4 Hour Workweek and The 4 Hour Body. In 2008, a friend gave me the 4HWW as a graduation present (thanks, Jack). At the time, I considered the gift to be somewhat of a joke and the book to be no more than a desperate marketing gimmick. For the first time in my life, I would be entering into the real working world (not for college credit, not for minimum wage), and the concept of a four hour work week seemed like a facetious ploy to prolong the inevitable- a lifetime sentence into the rat race. I wouldn’t end up actually picking the book up until 2010. It was not what I was expecting. Having majored in marketing, I had read a variety of other business books in my life. Most can be summarized as such: “HOO-RAH – you can do it” or “Madison Avenue is dying”. Most lacked any profound insight, at least in my opinion. So I went on a hike. I wrote a book. And the rest as they say, is history (cliché cringe). Some more of the back story. No Tim didn’t go out and buy a copy of Appalachian Trials. I sent that to him. Blindly. I never thought it would get passed his secretary’s secretary. At best I thought it would get tossed into the other pile of books that get sent his way on a daily basis. To know that he has at least glanced through it (judging by the pen placement – impressive sleuth work, I know), is one thing. For this to happen while a camera crew was documenting his life, is a whole other level of awesome. Unfortunately, that’s where the story ends – for now. 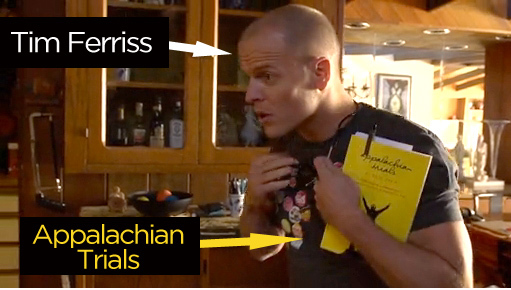 WHAT DID TIM FERRISS THINK OF APPALACHIAN TRIALS??? I MUST KNOW! In other words, please share 🙂 There are a bunch of familiar looking buttons underneath the video below. Just start clicking away! For those interested, below is the full episode of “A Day in the Life” with Tim Ferriss. It’s done by the same crew who made Super Size Me. A very worthwhile watch and an inside look into the life of the world’s most famous Appalachian Trials reader. Also, for those who share the Tim Ferriss admiration – learn how you can win a 30 minute coaching session with the man himself.